It was 8am in the morning and my husband and I were headed out to our cabin for the weekend. We hadn’t eaten breakfast yet and actually had a conversation on our way to Starbucks that a breakfast sandwich would be great that we’d just make eggs and hashbrowns once we got to our cabin. 2 caffeinated drinks were what we agreed on as we pulled up to the drive through but then the lady on the other side of the speaker threw us a curve ball….. I didn’t really think anything of it until we were waiting to pull up to the window and I thought: It’s 8am, why are they even offering a chocolate chip cookie and why did my husband buy one? My mind is always in business mode so I asked if he saw what she did there and started getting into the psychology of that cookie sale. So what was so clever about the barista’s sales technique? She didn’t ask if we wanted anything else with our order. And she didn’t ask if we wanted to add a cookie to our order. She asked if we wanted a chocolate chip cookie. She made the decision super easy for us to make. Yes or no. If she asked if we wanted to add anything else to our order we probably would have said no. We’re in line and don’t want to hold people up by looking over the menu, discussing what we could get and deciding on an option. But “Do you want a chocolate chip cookie?” It’s so easy to say yes. Who doesn’t like chocolate chip cookies? Even if I don’t want it right now, it will be a nice treat for later. How thoughtful of her to ask. You may have experienced a similar sales tactic at the grocery store when the cashier asks if you’d like to donate money to charity. Nobody likes to say no to charities but when there’s a lineup of people and you’re asked the question, you have to think about how much money is acceptable to donate? Do I look cheap if I give $10? What do other people give? How do I pay for it, I don’t have any cash on me…..”Ummm, not today thanks” is usually the easiest response. Or some people feel pressured into giving and then feel annoyed, which could be bad for repeat business. But when a teller asks to add $5 or round up to the nearest dollar for charity, people are more likely to donate because it’s a simple decision; yes or no. 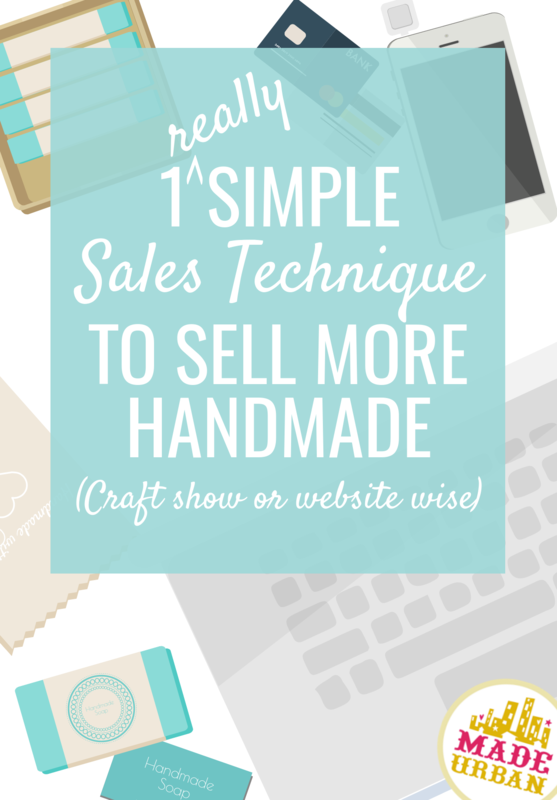 Although you’re not a cashier with multiple options to offer customers before they check out, this sales technique can still work for your handmade business. The key point to remember when it comes to boosting sales using this technique is to limit options. Although conventional wisdom may suggest more options equates to being able to accommodate to more people and thus make more sales, studies show that just aint true (Google “having more options is not better for business to find several articles and studies on this idea). Offering too much variety is an occupational hazard of being a handmade business owner. We’re creative people and there are no lack of ideas when it comes to what we can make. However, it’s really important to have a focus with your products. If you have too many options for shoppers to decide between, they may not even decide to buy one item, which then makes it impossible for you to sell them another item during check out. And if they do choose a product to buy out of the many choices, they may have decision fatigue (it’s a real thing) by the time they make it to the checkout, a negative response to “would you like to add _____?” may be more likely. Researchers found judges give less favorable rulings to criminals when it’s later in the day, due to the judge being drained from making many decisions. Decision fatigue is sometimes taken advantage of by retailers, the most common example being at grocery stores. They know shoppers have just spent several minutes walking up and down aisles making decision after decision when it comes to food choices. Consumers have decision fatigue by the time they make it to the checkout and their willpower is depleted, making them more likely to give in and buy that candy bar or pop. But that’s not the way you want to go with your handmade business. It doesn’t build brand loyalty, can leave customers disappointed with their purchase and may even lead to returns. The first step before you start thinking about what to upsell and how to sell it, is to narrow down your main product selection to increase the chances of your shoppers getting to the checkout and you having an opportunity to upsell to them. You can absolutely run a successful and profitable handmade business offering just one product; I’ve seen it done many times. And in all honesty, usually the fewer products a handmade business offers, the more successful it is. That’s not a rule…just an observation. So don’t let scaling your product selection down scare you. The fewer options your shoppers have to shop through means the easier it is to sell to them. When you have 5 people looking over the 50 different types of products on your craft show table, they’re there for a while. How do other shoppers get in there? A busy booth is great but when I’m at a craft show and I see a table with lots of lookie-loos, asking questions and taking their time, I’ll usually just head to another vendor. If a table is busy but people are moving through quickly, I’ll look over shoppers’ shoulders until there’s room for me to get in there. If you must explain a different set of features for each product and you have 50 products, you could spend a lot of time selling one item to one person. Sure the booths that have a large variety of products may look busy the entire craft show but their transaction per hour may actually be lower than a vendor who has just a few products to choose from. Always work off sales stats when making decisions on product changes. The best way to start narrowing your selection is to eliminate any items that don’t get you sales. It’s a waste of your time to build stock in items you don’t sell and they take up precious real estate on your craft show table or website. Look at your best-seller(s) and build your product selection around it/them. If you have several products and a few that do better, what are the commonalities among them? Do they all follow a certain theme, fall under a particular category or are they aimed at a certain customer? For example, if you sell jewelry, baby burp cloths and headbands for little girls and you tend to sell more of the burp cloths and headbands, it may be a sign that moms are a good segment of customers to target. Handmade businesses tend to look more professional when all of their products stick to one category or theme. The more variety you add, the more confusing your brand becomes. For example, a creator selling paintings, jewelry and scarves has products that fall under the categories: ART, JEWELRY and ACCESSORIES. It’s almost impossible to become an expert in all three while simultaneously building a strong brand and a business that operates smoothly. There are times where different categories of products can still create a cohesive line. And that’s when they’re all focused on a theme, instead of a category. For example, a graphic designer may offer their designs on fabric scarves and t-shirts (categories ACCESSORIES and CLOTHING). But even so, it’s best if all products still fall under one or two categories. To narrow your product selection down even further, it’s important to find a niche. It’s going to help give your products an edge and help you stand out from competition. You can find your niche by serving a specific purpose or person (e.g. high-end hypoallergenic earrings) or by focusing on a subcategory or sub-subcategory (e.g. clip on earrings). There are exceptions to every rule by my rule is to offer no more than 3 – 5 main products as a handmade business. You can still expand your selection by offering variety in each product. For example, instead of a jewelry maker offering 15 different types of necklaces, they could focus on three and offer 5 different types of stones, or offer 5 different types of necklaces, all in gold, silver or rose gold. They’re still offering the same amount of variety but they’re creating cohesion among their products and becoming more profitable. If you’re interested in more direction when it comes to narrowing down your product selection and making the right choices to build a profitable product line, download the free sample chapter from my ebook. 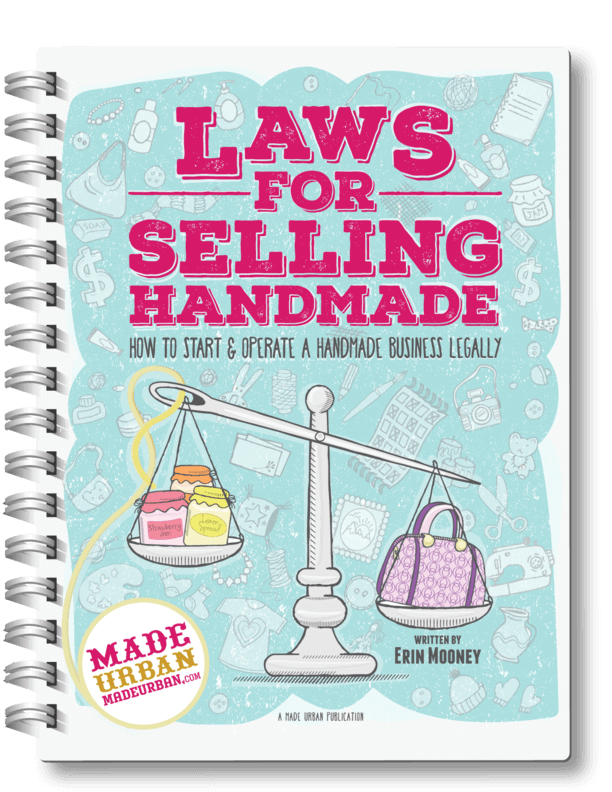 The free chapter is called MAKING PRODUCTS THAT PROFIT and has a ton of information packed into the 43 pages that is sure to make your handmade business more profitable. Aside from your main product(s), you should also have a smaller add-on item. You don’t need to go crazy and have several different options for customers to choose from. One upsell item will likely help you boost sales; it just has to be the right item. Once a shopper has made a decision and chosen an item to purchase, they key is to offer a smaller, easy-to-say-yes-to, item. This means something that is low commitment, doesn’t take a lot of pondering and doesn’t cost a lot of money. Increase your items per transaction – instead of selling one item to each customer, you sell two or more. Selling two items to one person instead of one item to two people cuts your work in half. Less work for you but increased profits. Add a lower price point to your product line – this gives an option for those with a smaller budget and is great for gift giving; they can bump up the value of their gift with minimal effort (i.e. they don’t have to go searching for another item) or they can buy an upsell item on its own for a smaller gift or stocking stuffer. Compliment/complete/care – a great upsell item will compliment an item a customer has already picked out (e.g. a loofa to go with body wash), complete it (e.g. a frame to go with an artist’s print) or care for their item (e.g. a polishing cloth that doubles as a storage bag to go with a silver ring). Bundle – you can also create an upsell option without adding new products to your lineup. Instead of asking if a customer would like to add a different item, you could ask if they’d like to take advantage of a value offer. It may be offering a slight discount if a shopper purchases 3 items instead of one (e.g. would you like to buy 3 soaps for $12.99 instead of the 2 for $10?) or having a gift set that groups 2 or more items together in a nice package and costs slightly less than buying each one separately. If a vendor is about to sell a pair of earrings, “would you like a necklace to go with that” may be a bit too big of an upsell. The shopper has likely already seen a selection of necklaces but decided to go with the earrings instead. Plus, the necklace is likely more expensive than the earrings so it’s a bigger commitment for them to make. Generally, the more expensive the item, the more thought it requires. But if instead the vendor asked, “Did you want to add a matching ring?” or “would you like to add a gift box/card/wrapping?” they may have more customers saying “yes”. However, there are exceptions. An upsell item may be a similar price to the main item or even more expensive. For example, a soap vendor may sell $5 bars of soap as their main product and offer a $7 soap dish. Although the upsell product is more expensive than the main product, it’s still not a big-ticket item that requires a long contemplation period or someone questioning whether it’s worth the investment or not. Although some may go rogue and shop products out of their natural order, most people follow a flow as they shop. You’ll notice this as you walk through a retail store. There is usually a display front and center of a store to draw shoppers in, get them to slow down and give them the space to take in their new surroundings. Sales associates may say “hi” to shoppers in this zone they almost never use any sales techniques in this area. Imagine stepping into a store and someone saying “Hi there! Have you heard about our great deals? We also have this brand new arrival I think you’ll love.” A bit too much right off the bat. Once a shopper is in the store and has decompressed they tend to turn right (based on studies) and then follow a path to make a lap around the store. When a customer is near the back of the store, they’re more committed. Higher priced items that often require a sales person to sell them, can be found near the back of a retail store. And smaller, add-on items are kept near the cash desk. This helps prevent theft, since a cashier is usually near the smaller, easy to conceal items, and it also give shoppers product to browse through while they’re waiting in line or having their purchase rung through. The perfect place to put this sales technique to use. Your craft show table and online shop should follow a similar approach and showcase the upsell items near the end of the shopper experience. In my ebook, I explain how to break your craft show table or booth into zones. Zone 3 should be considered your checkout and where you place your smaller, add-on/upsell items. Even if you only have a few feet at a craft show, you can still create zones. On a small craft show table, the end of the table shoppers reach last (going with the main flow of traffic) would likely become your Zone 3. This is where you scooch shoppers over to as you wrap their product and complete their transaction, giving new shoppers space to browse your main products. Displaying your upsell products in your Zone 3 gives people smaller items to look over while waiting for you to gather change, wrap their purchase or process their card. It’s similar sales technique grocery stores use at their checkouts. Although you likely don’t have “gum”, “candy bar” or “gossip magazine” on your grocery list, you’re more likely to pick them up because they’re right there, easy to grab and only a couple dollars. Obviously you want people to be able to shop all your products at any given time and don’t necessarily want your upsell items hiding in the checkout process. But consider adding a new functionality to your website that allows you to display upsell items in the shopping cart phase (as well as on their own page if needed). They may have a tab on their website to shop these items, but presenting them as a step in the checkout process increases their sales. The last step is to find a way you feel comfortable to ask. 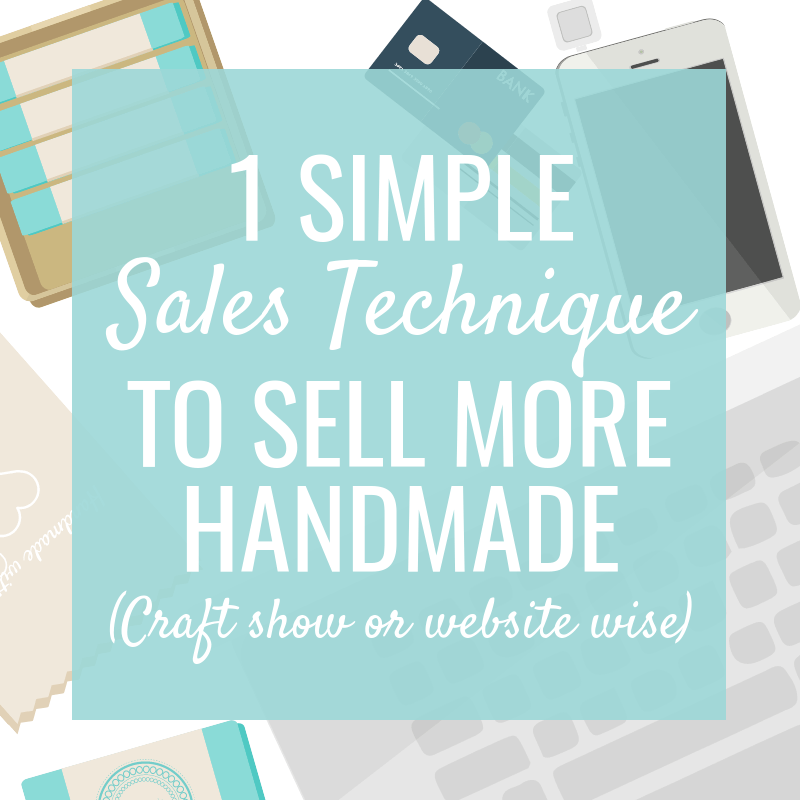 I know selling isn’t easy for a lot of handmade business owners and most of us are happy to get the first sale, we don’t want to push it or come off as though we’re pushy. Asking for the additional sale may feel a little uncomfortable and greedy in the beginning. But it’s not greedy to ask for a sale and you’re not tricking anyone into buying something they don’t want or need by asking a question. You’ve worked hard on your pieces and a customer is always free to say “no”. Remember, the more decisions a shopper must make, the less likely they are to make one. Keep your upsell selection to a minimum so it’s an easy question to ask and an even easier one to answer. A wreath maker may offer wreath hangers in a basket in their Zone 3 and simply say “Would you like to add a wreath hanger to your purchase for $4.99?” while cutting off the price tag and wrapping the wreath. You don’t even have to make eye contact while you upsell! Not that I’m suggesting no eye contact is a good sales technique, but the point is: it’s an easy question to ask and there’s no need to feel uncomfortable while you ask it. If there is more than one option when it comes to your upsell items, you may need to put a little more effort in to make the decision easy for the shopper. For example, a jewelry maker may offer rings to upsell with their necklaces. If there are 3 different colors/metals/stones to choose from, they may pick out the ring that matches the necklace the shopper picked out, place it in front of the ring tray and ask if they’d like to add a matching ring to their purchase, suggesting they love this one as an option. By picking out which ring they’d suggest be paired with the necklace, it lessens the decisions the shopper must make, making them more likely to say “yes”. Do I want one? Do I really need it? I could just tell her I already have too many rings at home, that way she doesn’t think I don’t like the rings. People are waiting behind me, I better just hurry up and say no. You: Would you like a ring too? Okay, sometimes they may say “no” but if you’re offering the right upsell item at the right price, they’re more likely to say “yes”. Selling online takes the pressure off since your website does the selling for you. However, you still want to find the right wording that works with your brand and show’s it’s personality. Again, the key is to keep the options to a minimum; one upsell option is perfectly fine. You can play around to find the right balance for your business and products but a good rule of thumb is no more than 3 options. Many more and you’re giving them too many decisions to make. You don’t have control over shipping fees so if you’re offering rush shipping, although the customer pays more, you must pay more too. But if orders typically take a few days for you to process and ship out by the time you make it to the post office, you could offer a rush service for an extra fee. This will likely be popular during the holidays. How many people have asked if you can get an item to them within a few days in the weeks leading up to Christmas? I would get the question all the time and usually work harder for that customer without any extra compensation. You must get paid for these additions. Not only is it unfair to you, not to pay yourself for the extra work, it’s unfair to all the customers who paid the same price but didn’t get the extra service. Offer the option for customers to pay an additional price and have their order packaged and shipped out same day or next day. Just be sure you’re on top of orders and checking a few times a day to see if any rush orders came in. It’s an important one for all small business owners to read and to learn the difference between earning money and making money. And many more important lessons I believe are imperative for handmade business owners can be found in the 43 pages of the free sample chapter. Download that here. Have you ever had a similar sales technique used on you? Did you say yes? 😉 How would you ask customers if they’d like to add an upsell item? Share in the comments!